A leading figure in the world of 20th century fashion once he launched his New Look spring/summer collection in 1947, Christian Dior took the feminine shape in a totally new direction, relegating the masculine silhouette of the war years to the past. His dresses expressed a modern femininity, incarnated by his flower woman and producing a shape characterized by flowing curves and the bearing of a classical ballet dancer. The New Look featured soft shoulders, accentuated busts, nipped-in waists and hips amplified by swirling corollalike skirts. Christian Dior relaunched the textile industry with his insistence on the use of great swaths of fabric, a controversial move after the years of shortage under the Occupation. He succeeded in breathing new life into the couture tradition, giving a central role to embroiderers and craftspeople making costume jewellery and accessories. Dior invented an internationally-focused couture that put Paris back in the spotlight as the capital of fashion. 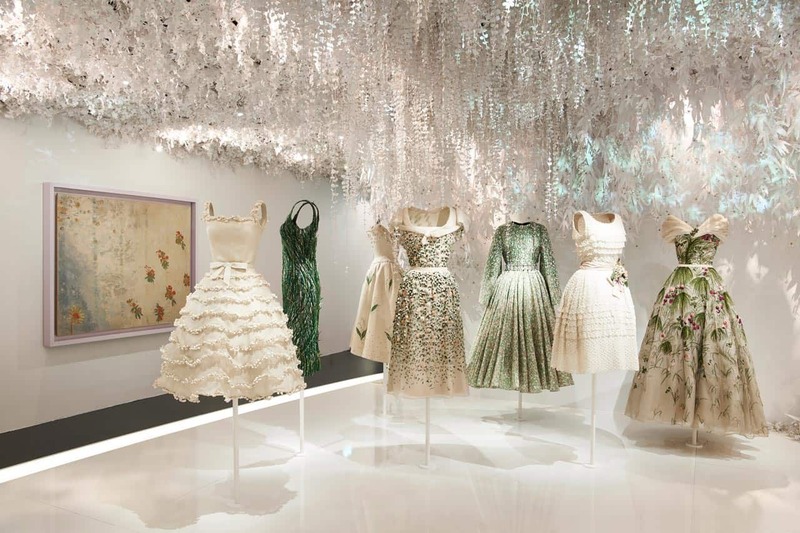 The lavish and comprehensive exhibition (open until 7th of January) at Musée des Arts Décoratifs is celebrating the 70th anniversary of of the legendary fashion House of Dior. The selection of over 300 haute couture gowns designed between 1947 and the present day has a unifying thread of emotions, life stories, affinities, inspirations, creations and legacies. Alongside the dresses is the most wide-ranging display to date of atelier toiles and fashion photographs, as well as hundreds of documents, including illustrations, sketches, documentary photographs, letters and notes and advertising documents, and fashion accessories, including hats, jewellery, bags, shoes and perfume bottles. 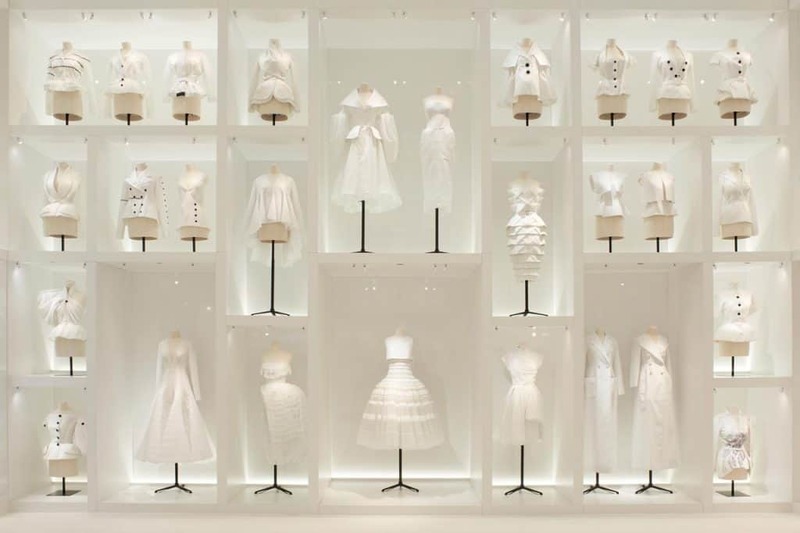 This retrospective shows how Christian Dior and the six artistic directors who followed on his heels devised the brand and built up the influence of a name that is the very embodiment of haute couture in France and throughout the world. Before turning to fashion, Christian Dior ran an art gallery from 1928 to 1934 in partnership with his friends, first Jacques Bonjean then Pierre Colle. Dior was a lover of antiques and objets d’art, an Art Nouveau collector, a decorator enthralled by the 18th century and a garden enthusiast. He drew on all these sources of inspiration to embellish his private residences and define the aesthetic for his couture house and designs. His gowns were full of references to painting and sculpture as well as everything that makes up the art of living: wallpapers, fabrics, china and chinoiserie. Even before he founded his prestigious couture house, Christian Dior had set his heart on number 30 of Paris’ legendary Avenue Montaigne. Today, it is one of the Paris major attractions, drawing visitors who want to worship at the temple of good taste. The birthplace of an endless line of magnificent creations, such as the Bar suit unveiled on the first floor there for the first time on February 12, 1947. The iconic shape of the suit with black and-white ensemble demonstrates every aspect of the innovation Dior introduced with his new aesthetic, triggering a golden age of fashion. The suit has continued to haunt the imagination of the fashion world and many of its couturiers and designers ever since. Gowns like Vénus, Junon, Coup de théâtre, Soirée brillante: with their dazzling names and flamboyant styles, were graceful, bold and supremely elegant and they played a part in the renaissance of society life after the war and revealed the extent of Christian Dior’s creativity. But the enduring nature of the Dior spirit also stems from the different artistic directors who carried on the couturier’s work after his death in 1957. His successor, Yves Saint Laurent, adopted a similarly bold and rebellious stance, dramatically raising and lowering hemlines. With the 1958 arrival of Trapèze, Saint Laurent’s first collection for the House, the corolla of the founder’s flower-woman was inverted by combining fitted fronts with airborne backs, seemingly weightless and heralding the free-spirited culture of the 1960s. The daring choice of the very young Yves Saint Laurent was followed by Marc Bohan’s more rational appointment. He offered a modern reinterpretation of the House’s original spirit: presenting the Slim Look and a silhouette perfectly attuned to the new sylphlike ideal of feminine beauty. Next came the flamboyant Gianfranco Ferré who introduced architectural looks in an uncompromisingly baroque style. The extravagance set the stage for the arrival of John Galliano’s quintessentially British eccentricity. Giving free rein to his audacious spirit, he indelibly pushed the boundaries of creativity. Next, the minimalist statement of Raf Simons’ appointment delved deep into the House’s archives to deliver a vision structured by a whimsical and contemporary romanticism. And now, Maria Grazia Chiuri, the first woman to lead the House, is joyously upholding Christian Dior’s cherished codes, but also following in the footsteps of her other predecessors in this position. She is working to craft looks for today’s women, who are fully aware of the challenges faced in the world and reaffirm through their vestimentary choices a commitment that reaches far beyond the realm of fashion: a new woman for our time, the standard-bearer of a prodigious legacy. 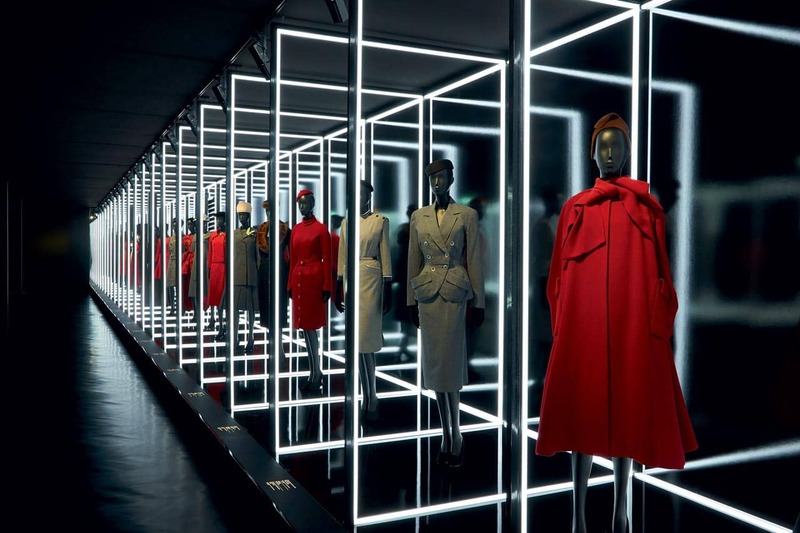 As it turns seventy, the House of Dior is more relevant than ever, resolutely in step with the realities of our contemporary world.